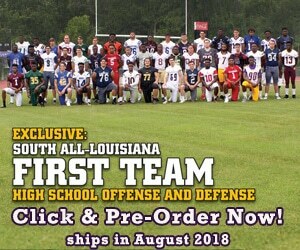 April 15, 2010 – Competing in high school football in the state of Louisiana requires effective strategizing and execution on the field- tangible elements of the game that can be controlled by the coaches and players. But in a division where every team is a contender and any team a threat to win the championship, sometimes intangible forces are needed to prevail. According to Emannuel Powell, the head coach of the OP Walker Chargers, discipline is that intangible element that will separate his team from the highly talented competition in 4A New Orleans football. Coach Powell is new to the program at OP Walker, but only from the coaching standpoint. As a player in the early 90s, he regularly experienced the feeling of winning the district championship, when the Chargers had home-field advantage going for them. Now, without an adequate field to play on, and with rivals like Warren Easton and Edna Karr boasting programs on the rise, the pressure on the Chargers’ squad is mounting quickly. OP Walker’s team should have the benefit of size on both the offensive and defensive lines this upcoming season, a year which Powell believes will be a “carry over year.” Essentially, this means that the things that have worked for the Chargers in the past- running the ball with speed and power, implementing the spread offense, and shaking up defensive formations from a 4-3 to nickel coverage- are still intact. But they are not enough, given the level of competition mandated by the school’s two year contract with the Louisiana High School Athletics Association. So clearly something else is needed, and that something is discipline. On the field, this kind of play takes the form of avoiding penalties and not allowing your emotions to get the best of you. His emphasis on discipline stems from his experience as a defensive player during his playing days on the field, where taunting and trash talking are par for the course. The ability to remain focused and ignore the other team’s attempts to bait you is instrumental in avoiding the stupid penalties and turnovers- the things that can ultimately decide a game in such a tight division. Playing with discipline also requires patience- running the same plays repeatedly in practice to ensure flawless execution on the field, and trusting the words of the coaches. Powell and his staff seem to have that going for them right now as they enter the offseason workout phase, which for them is characterized by heavy conditioning (Powell also coaches track), and simulating game time situations in practice. The emphasis on improved special teams play will also factor into the Chargers’ practices as a means of reinforcing the need for discipline. In a tough loss to 5A powerhouse and state runner up Archbishop Rummel last season, special teams play accounted for the difference in score at the end of the game, primarily due to the Chargers’ lack of preparation on that aspect of the game. OP Walker also lost a heartbreaking triple overtime game to Edna Karr last season, and was cheated out a victory against Brother Martin when the clock malfunctioned. The ability to remain focused and resilient after these kinds of losses reflects the discipline factor that is going to win games for the Chargers’ this season. Leading the way is senior running back Robert Kelley, who rushed for over 1200 yards last season behind a powerful offensive line, which is led by senior Isiah Webster. Developing more speed and explosiveness will be the main goal of Powell’s offensively minded colleagues, while he handles the defense and special teams and their need for disciplined play. Led by All District defensive tackle Anthony Johnson (committed to LSU), and fellow linemen Demiko Tatum and Cortez Johnson, the Chargers will continue to intimidate opponents with sheer size and strength on the lines. Having added another layer to its foundation, the OP Walker football team stands poised to take a shot at the district title this year, assuming they can remain disciplined and focused in the offseason and let that mentality work its magic on the field this fall.